It’s that time of year. “Old Man Winter” is upon us. Along with the colder temperatures, there are also more hours of darkness and our days have been effectively shortened. This, coupled with our busy schedules, can mean we are forced to get out and put our miles in during the early morning or later evening hours. Running in the dark brings with it challenges and risks we aren’t faced with when running in daylight. There are two points of emphasis regarding safety when running in the dark. First, your visibility to others and secondly, your ability to clearly see where you are running. 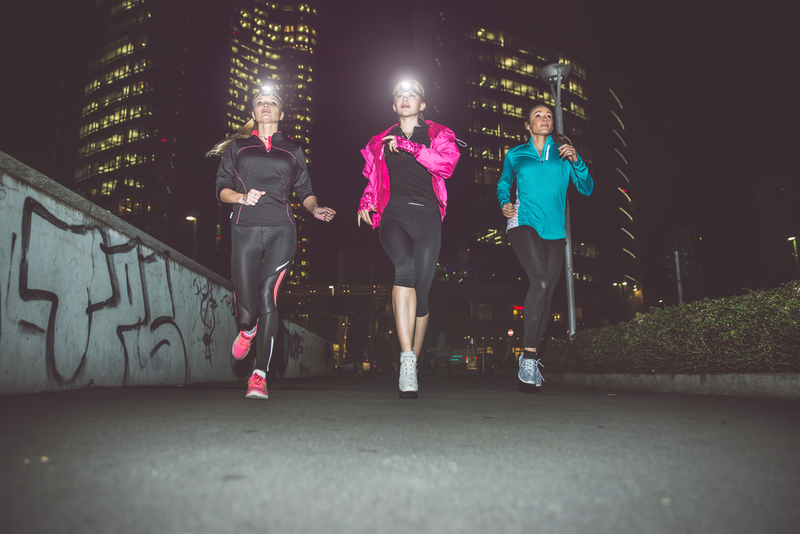 This short blog will give you some tips and information, on both, to ensure that you remain safe when running in the dark. Today, there is an abundance of brightly colored running gear to choose from. Choosing to wear brightly colored clothes is an easy way to alert others to your presence. 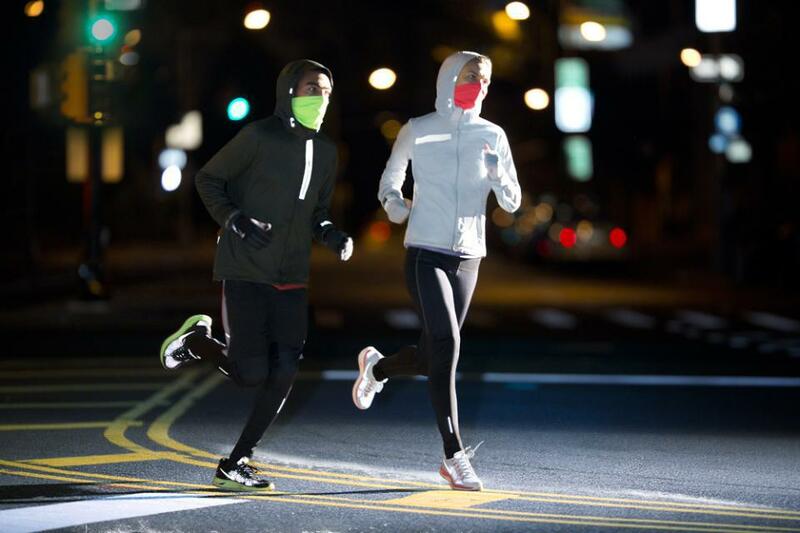 However, this may not always be enough when running in the dark. Having gear that also has reflective properties can mean added safety and visibility from a longer distance away. Most of the brightly colored running gear also has reflective aspects to it, but not all. With that in mind, if your gear doesn’t have reflective properties, there are vests, belts, ankle/wrist straps, gloves, hats/visors, amongst other items, that provide for reflection and lighting. However, it is important to understand how visible you will be from all angles as some of these products are limited in their coverage and may not be seen well from all vantage points. Other visibility options include small lights you can hold in your hand or attach to your body/clothes in a variety of ways. The purpose of these lights is to make you more visible. Many of them will have steady state as well as blinking features to enhance noticeability. As with the reflective bands, a drawback may be the lack of visibility in all directions. You can also find vests that provide for all components; brightly colored, reflective properties, and lights that are built in. Generally, these vests will provide for visibility in all directions. Now, time to address the second point. Illuminating your running path is often an afterthought for many runners. Sometimes we may be running in places where there are no street lights and/or the ambient light is not enough to clearly see where we are going. There is nothing worse than tripping over something in your path, full stride, because you couldn’t see it right in front of you. Head lamps are a great way to avoid this. There are many good quality head lamps out there that can provide the proper amount of illumination you need to clearly light up the path in front of you. They will also provide for some additional visibility but only for those who are coming directly at you. Headlamps, thus, are great for lighting your path but not the best for making yourself noticeable to all you will encounter. Staying safe in the winter is more than just properly dressing for the cold temperatures. When running in the dark, making yourself visible to drivers, cyclists and other pedestrians and making sure your path is clearly illuminated, is of utmost importance. By investing in the proper running clothing and equipment you can ensure that you don’t fall victim to an unnecessary injury or accident.